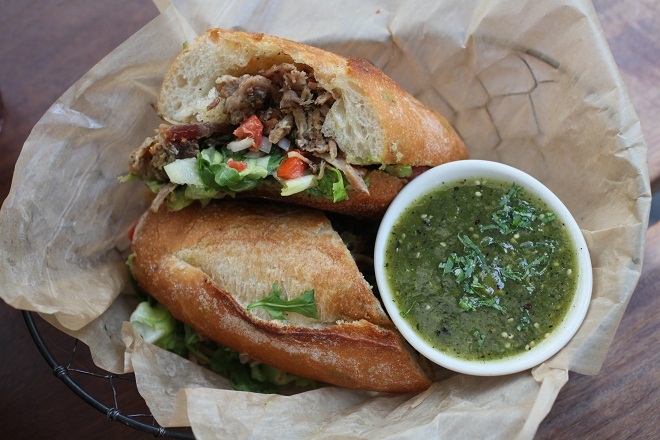 Summer Carnitas Torta: Gunthorp Farm pork carnitas with salsa Mexicana and guacamole! Watermelon Goat Cheese Salad: ...served over Bayless Greens and leaves of cilantro! 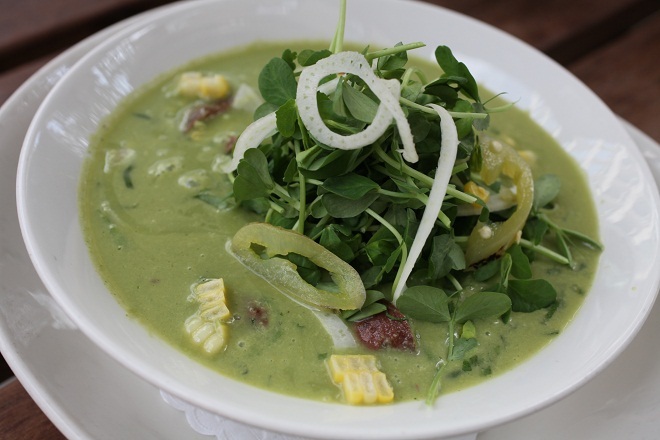 Roasted Chicken Soup: Gunthorp chicken, fennel, poblano and local sweet corn! Melon a la Mexicana: Nichols Farm heirloom melon - street food style! 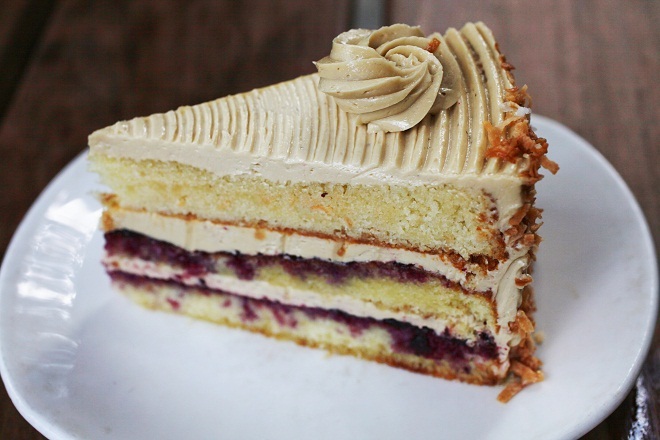 Coconut Layer Cake: with blueberry jam and piloncillo buttercream frosting! Plum Tart: local fruit and frangipane meet Xoco chocolate! Chef Alonso has spent the past month surrounded by beautiful heirloom tomatoes and just couldn’t take it anymore: he had to make a batch of salsa Mexicana (aka pico de gallo)! In this classic salsa the three colors of the Mexican flag are represented by local tomatoes, serrano chile, and onion. Golden pork carnitas, slow-cooked at low temp for about 18 hours, guacamole made with amazing Michoacan avocado, and salsa Mexicana… you #tortally need this sandwich in your life. Inspired by Chef Alonso, and former Xoco Chef Adrian, in whose shoes he now stands, Chef Glenn has unleashed his own creativity for the Roasted Chicken Soup. Glenn butter poaches leeks for an hour to begin the creamy broth, building into its flavor poblano chile and fennel. Gunthorp Farm free range chicken breast is the star, with local sweet corn and spicy grilled chile guero sharing the stage. It’s at once comforting and complex, and has our team excited to try more of Chef Glenn’s dishes! As a kid, I thought all watermelon was the same. At Xoco, I have discovered and fallen in love with the subtle nuances of color, sweetness and juiciness in the heirloom watermelons grown at Nichols Farm. 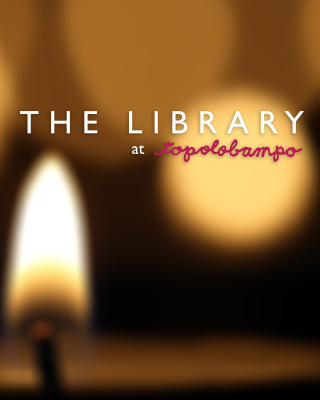 Xoco is celebrating the season two ways! 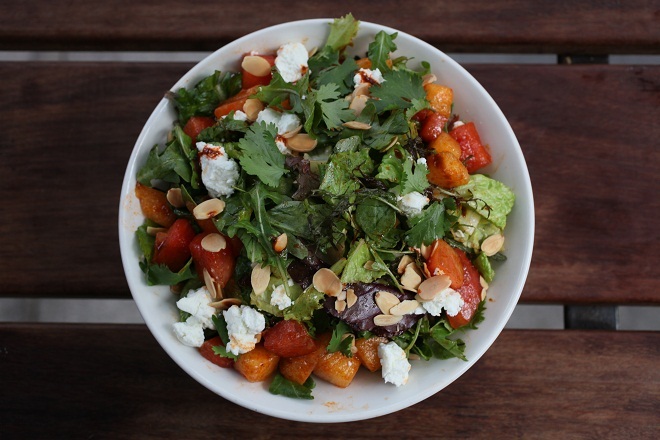 In our new salad we have paired watermelon with tangy Prairie Fruits Farm goat cheese and nutty roasted almonds over Bayless Garden greens and leaves of cilantro. 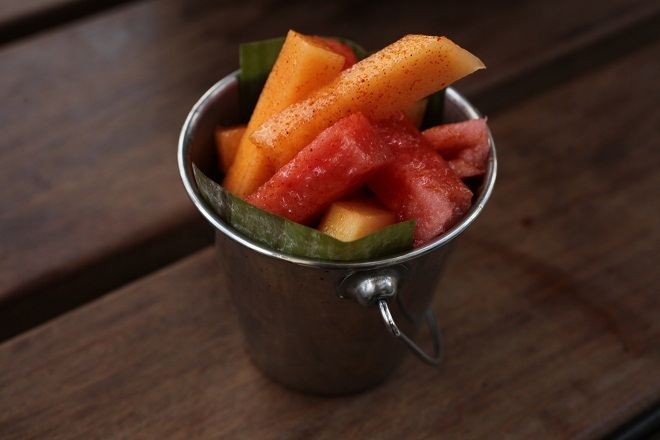 And, for the first time ever, Xoco is serving a street snack of diced local melon with lime, chile and salt (Chef Alonso’s secret recipe) as long as watermelon is available. Xoco is going to rock your watermelon socks off! 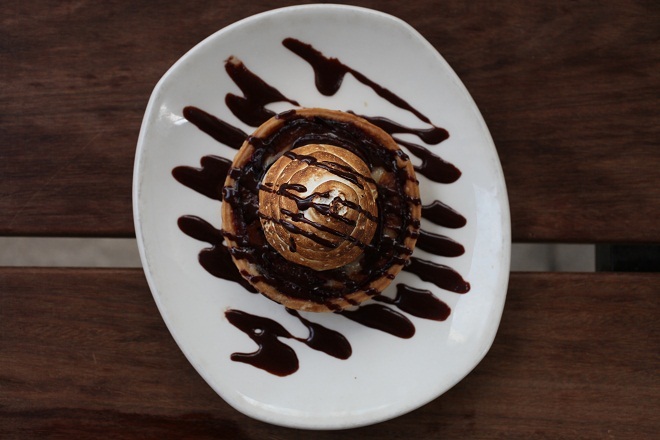 For those cooler September evenings with a hint of smoke in the air, where you just want to curl up with a sweet treat, Chef Wendy has just the ticket. Her trio (!!!) of new pastries includes a Plum Tart with almond frangipane, drizzled with Xoco chocolate, as well as a Grilled Peach empanada filled goat cheese and walnut… both served warm right out of the oven. Chef Wendy has earned a reputation for amazing cakes. Her blueberry jam filled Coconut Layer Cake, iced with piloncillo buttercream, is one of the best of all time! Whether it’s a blazing hot day or a breezy evening, when you walk by our restaurant and see Wendy frosting cakes in the front window, or the cooks slicing and dicing tomatoes for salsa Mexicana, it’s going to be hard to resist… we’ll see you inside Xoco! Went for mother’s day lunch today and had the best food ever. Enjoyed thoroughly. Service is absolutely the best. Only regret is, didn’t get to meet Mr. Bayless!!! May be next time. Very glad to see a vegan item on the menu. Hats off to the restaurant, that romanesco looks fabulous. Is the chef’s Wendy’s coconut cake recipe available ?? Help from the website please. We have a question and don’t see a Contact Us link. 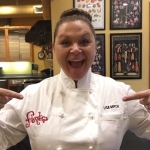 We are looking for a recipe seen on tv this week in Indianapolis. I thought the show was in Merida, Mexico. Recipe included puff pastry, cheese, ham and b? ?chamel I believe. Can’t find it anywhere. Also curious about the cooking school mentioned. I believe it was a local chef – Duo perhaps?